Photos 301 - 399 on this page starting December 03, 2007 and ending February 06, 2008. 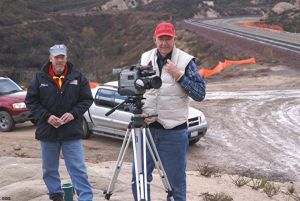 Christmas 2007 at famous Hill 582 with the even more famous people behind the scene. 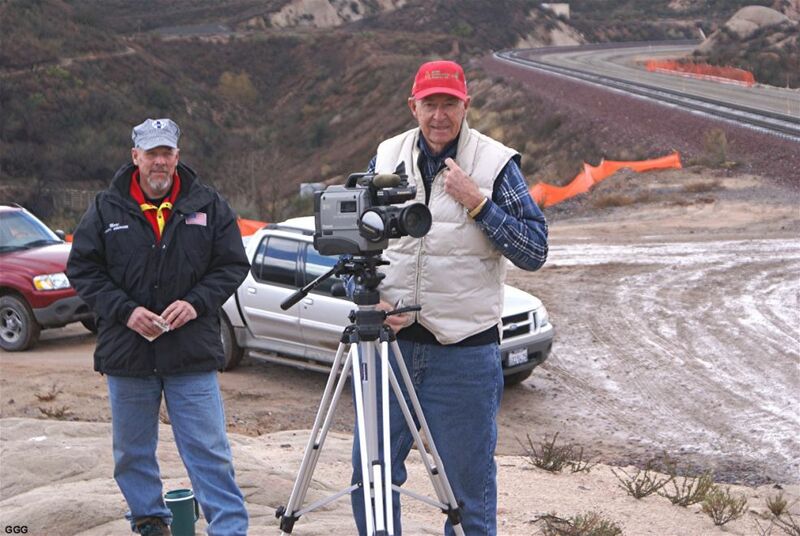 Without the help of Don and Gary, this 3MT site would not be possible. Photo 307 shows the existing signal at MP 60.2X (right in the middle of the new CP Walker switches/signals). 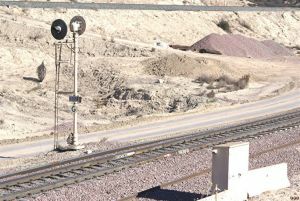 The new 3MT will replace this signal on the far side of the existing # 1 track. 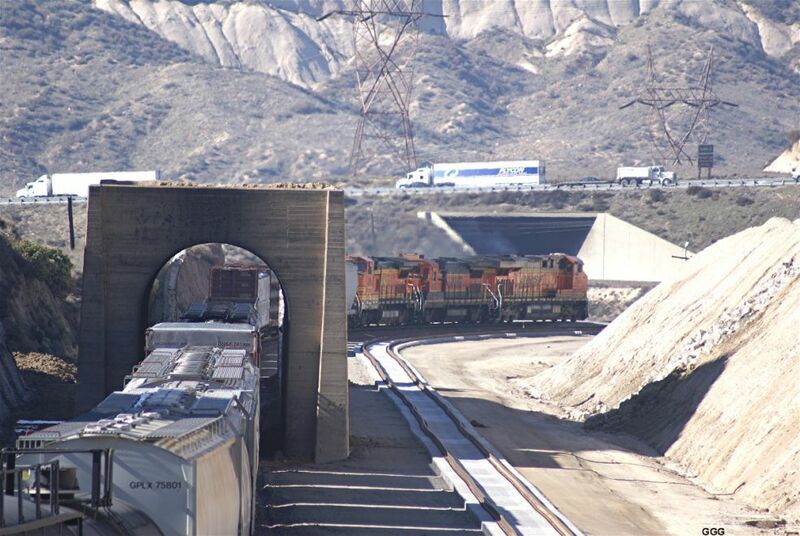 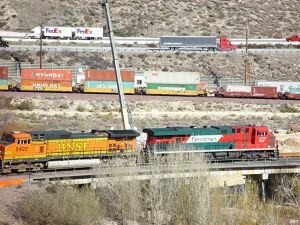 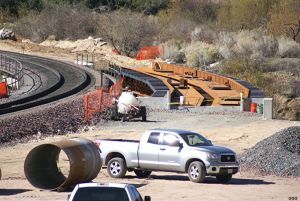 Photo 308 shows BNSF 7778 WB through the new (and not yet in service) WBCS (West Bound Control Signals) at CP Walker. 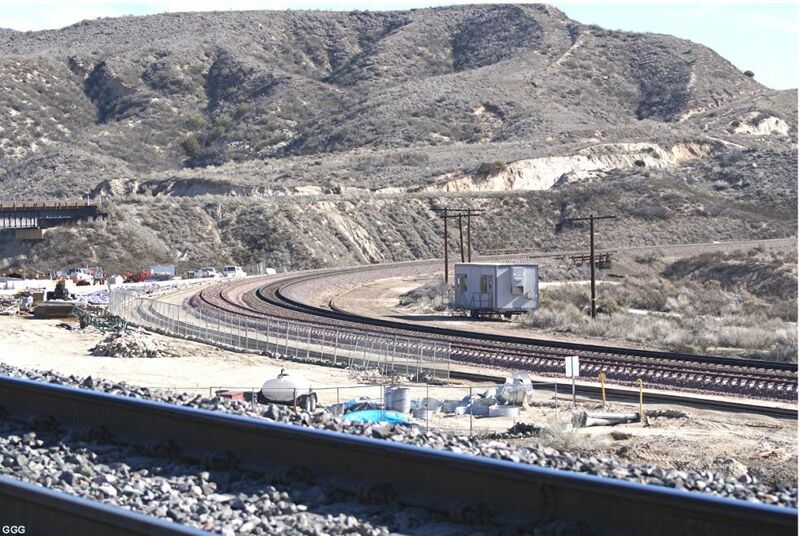 A switch is being built for shunting from the new 3MT to existing Main 1. CP Walker will be a HIGH honor to a great man and super friend ! 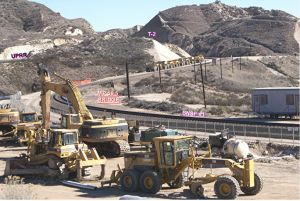 Four from Sullivan's showing the construction progress over two weeks. There's not much left of a rather formable hill just North of the Sullivan's Overlook. 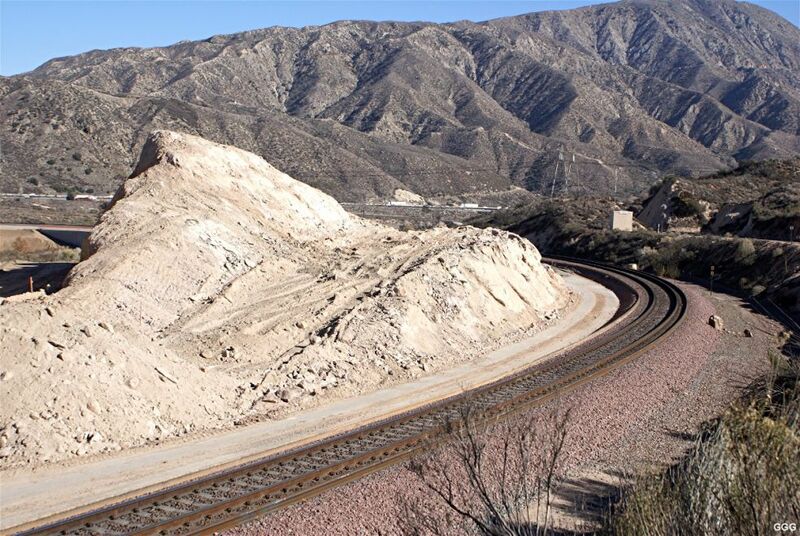 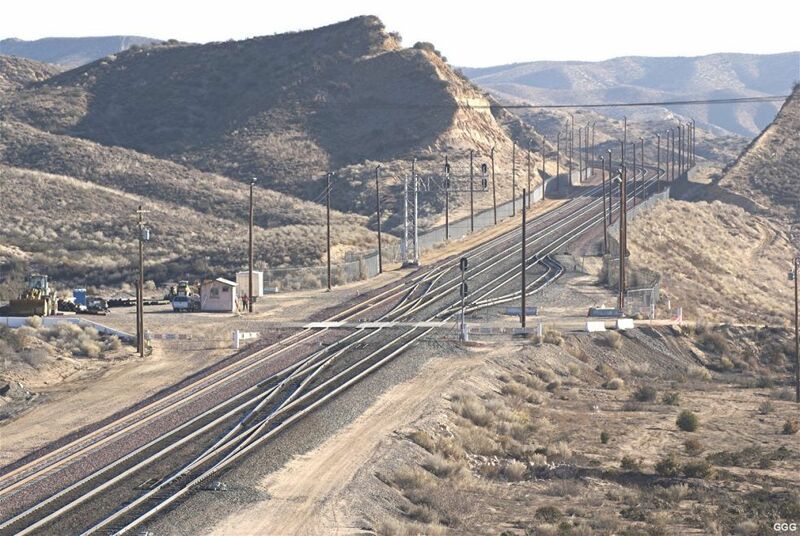 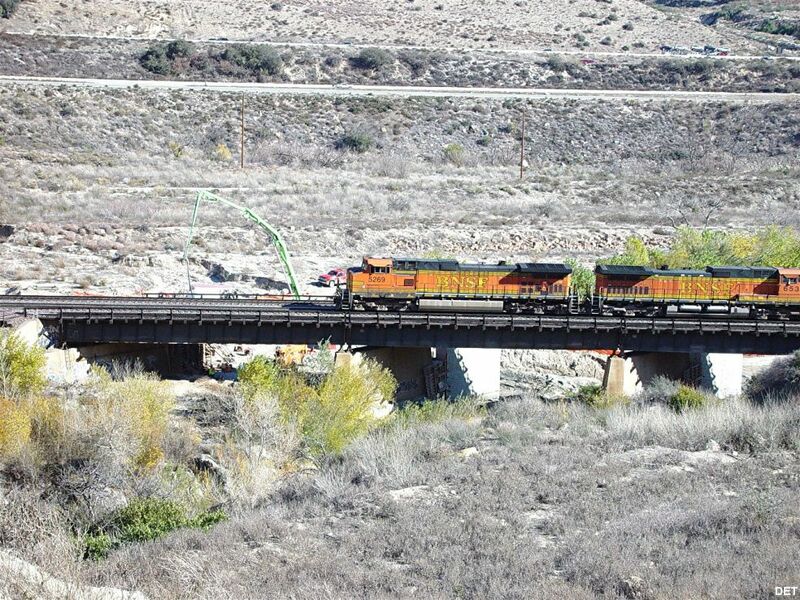 Both UP trains are on their own tracks (UP's Colton - Palmdale Cutoff, built 1967 by SP). Photo 316: Progress at Tunnel # 1 --- with only 15+/- feet of dirt remaining above the barrel. 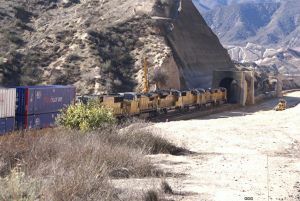 Photo 318: T-2 EP --- 1923 extension to the 1913 tunnel (how many days will it remain?) 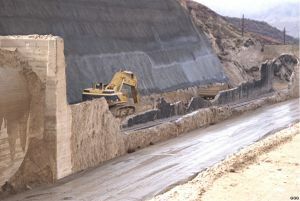 --- ShotCrete wall is almost finished. 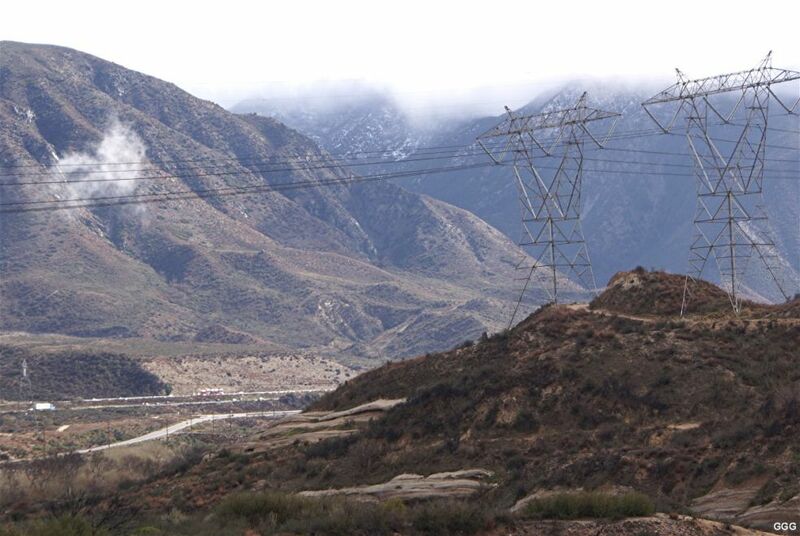 Photos 320 - 321: Two really nice DET's from our recent "blizzard" which put some snow over Cajon. 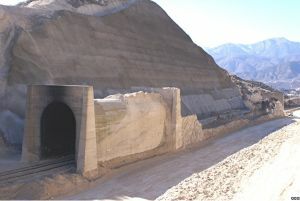 Both are taken from Hill 582. 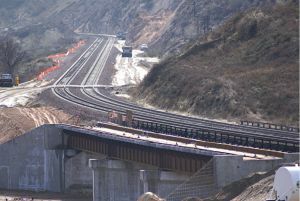 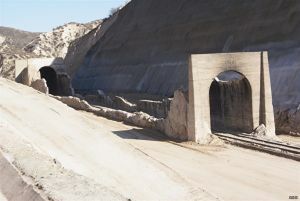 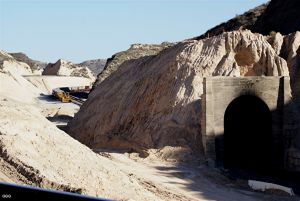 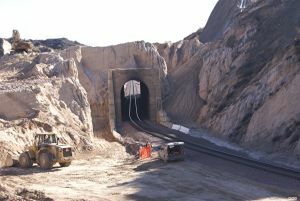 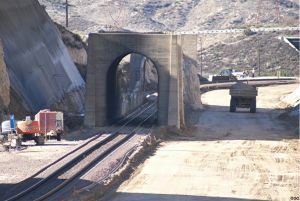 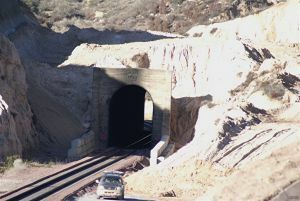 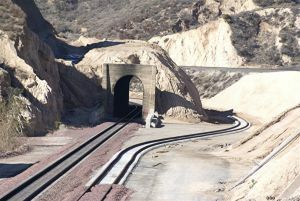 As of last Friday, 01-11-08, Ames Construction had turned its upper Pass attention to Tunnel 1. 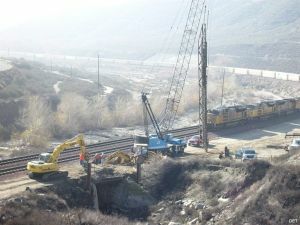 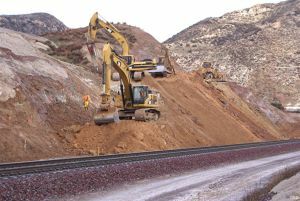 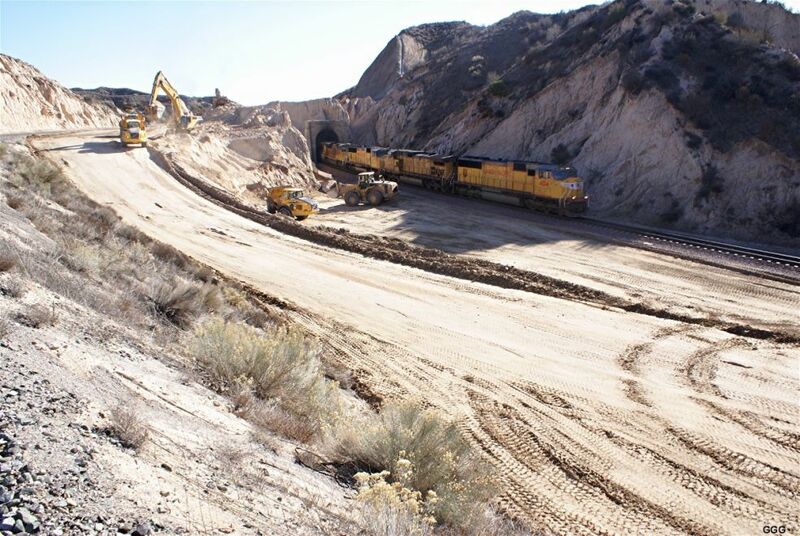 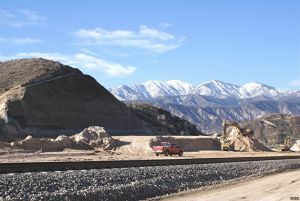 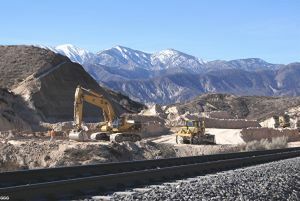 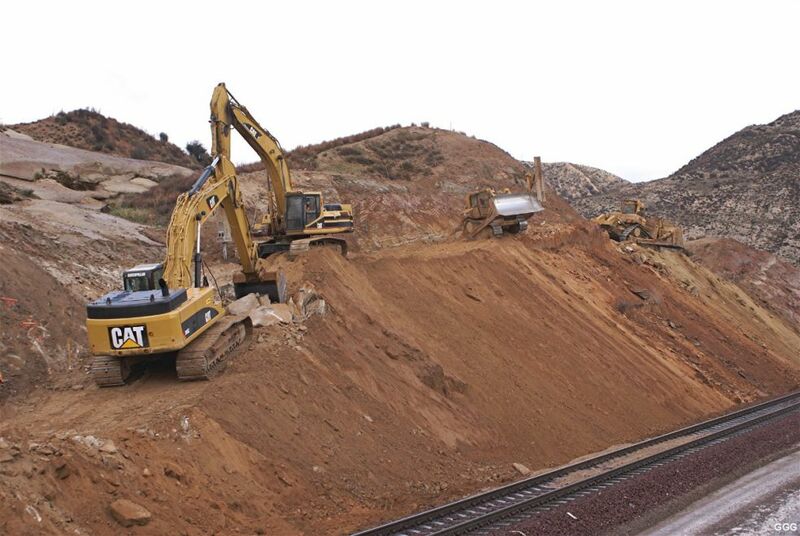 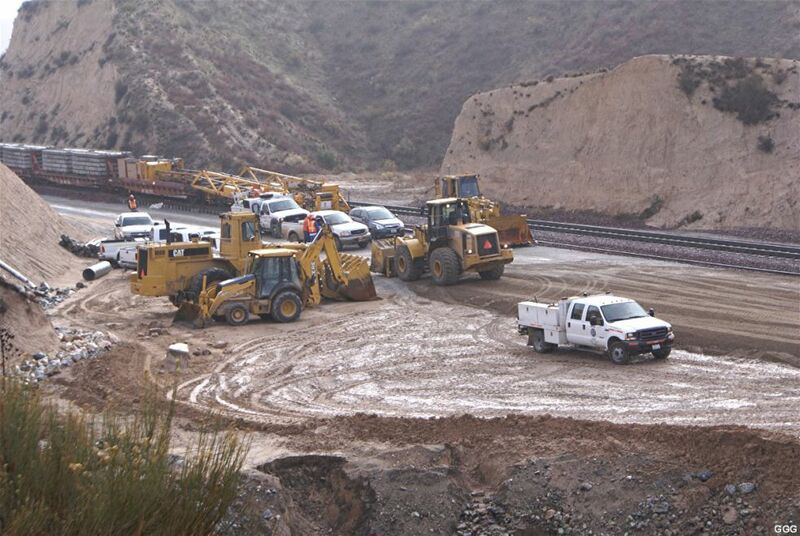 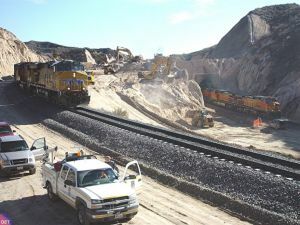 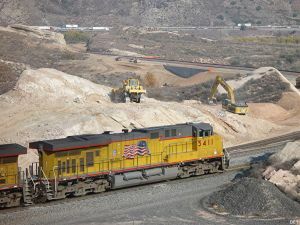 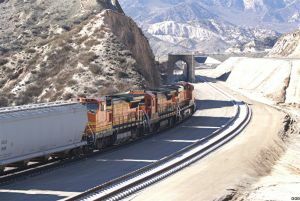 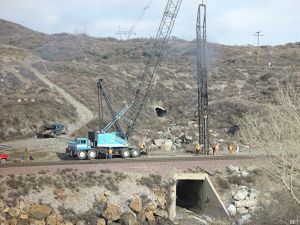 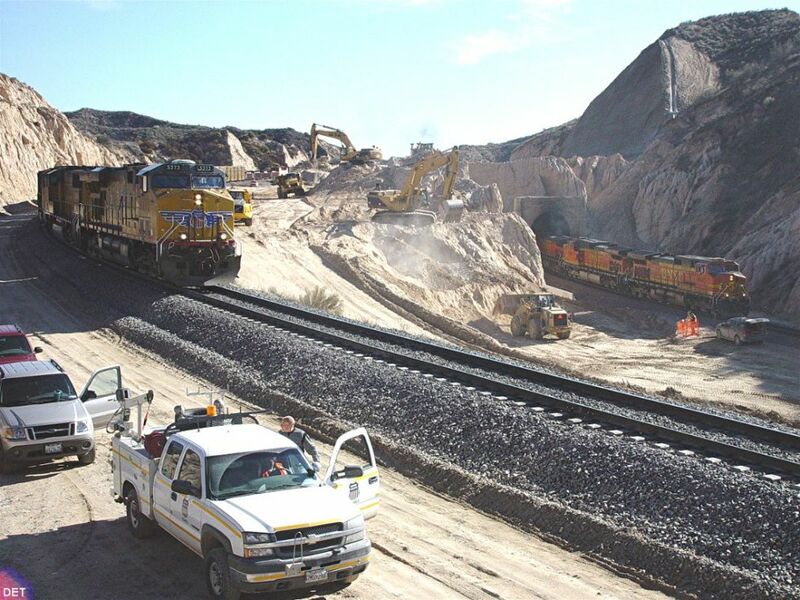 Six large machines and a number of large dumps were working on the "north" side of T-1 (between the existing BNSF # 1 track and the UP/SP track above). It appears to us that the plan is to get the dirt down to BNSF track level, build the sho fly, and then remove the remains of T-2 and all of T-1 concurrently. 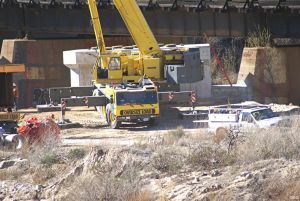 So, here are five of the 01-11-08 progress at T-1. 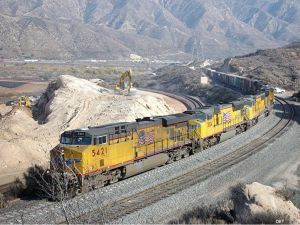 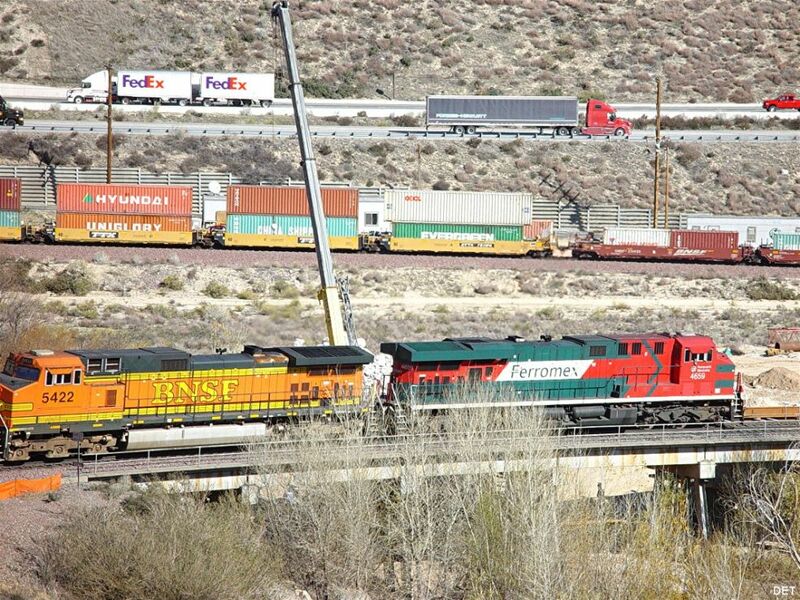 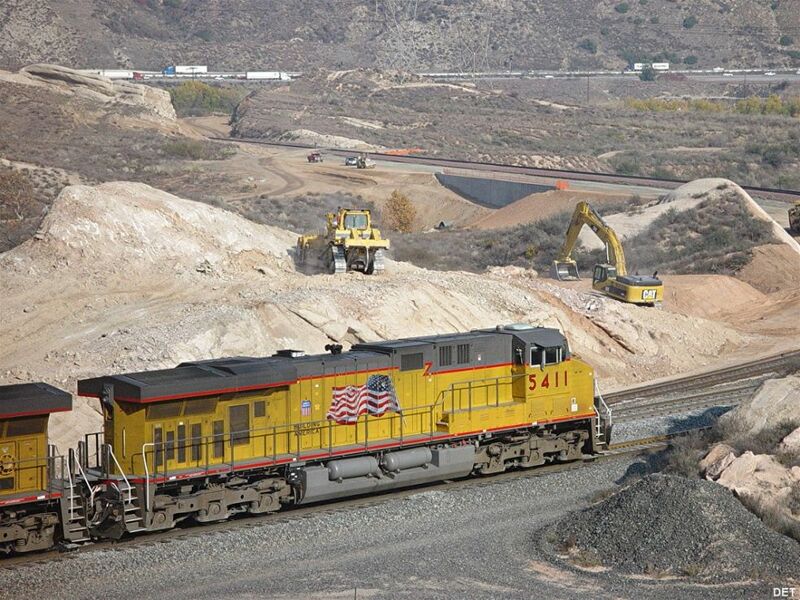 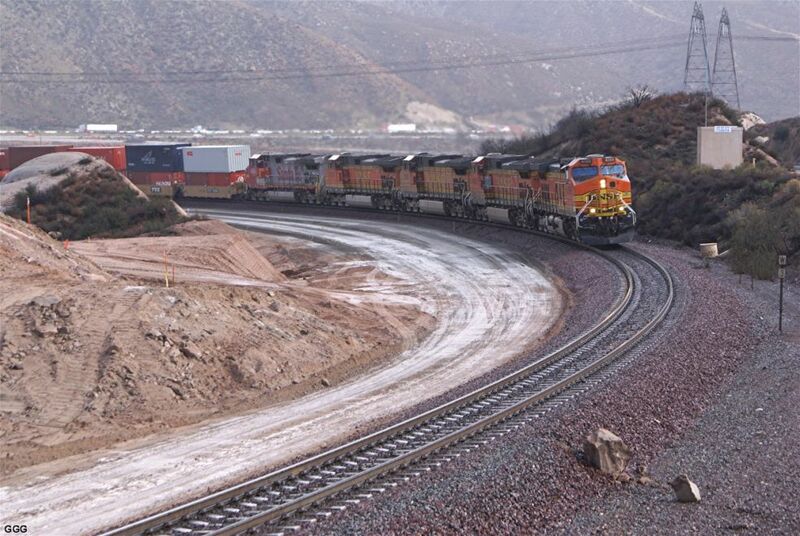 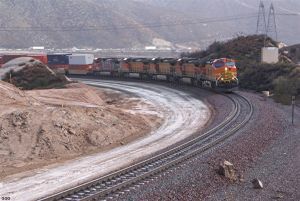 Photos 327 - 328 show machines working at T-1 EP ---- between the UP and BNSF tracks. 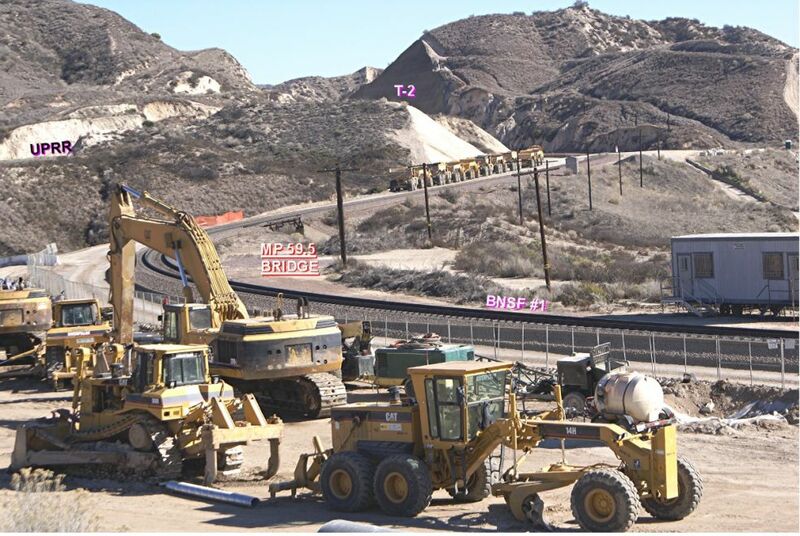 Photo 329 shows the dirt level atop T-1. 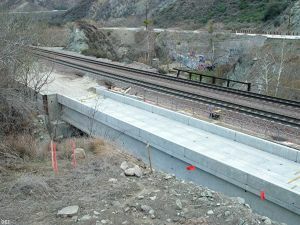 The shown track is UP. The area where the red truck sits will be lowered about 50 feet to allow the new 3MT/sho fly to be built. 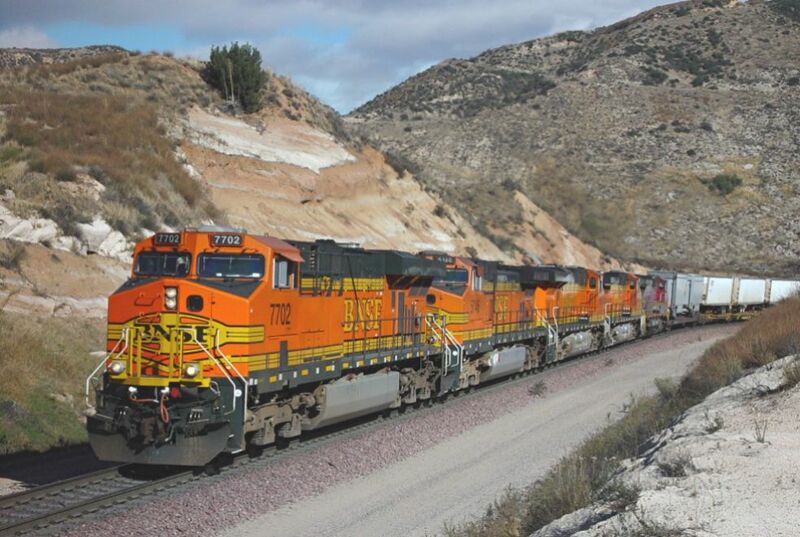 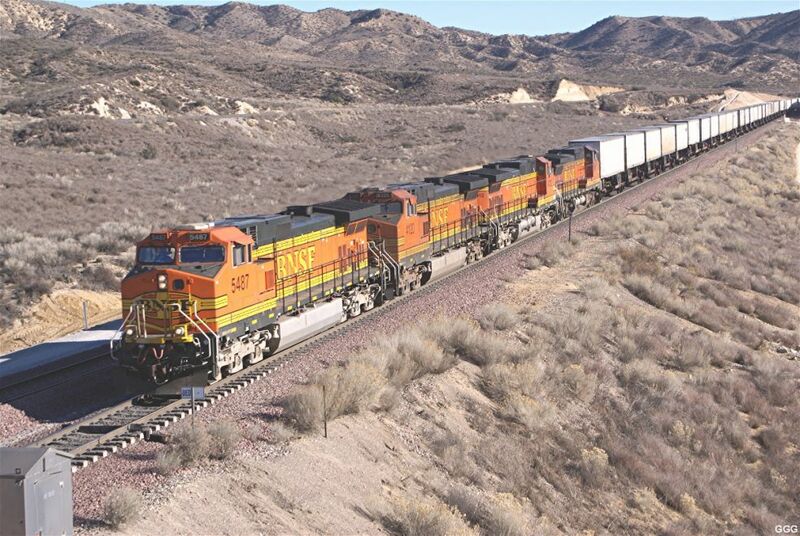 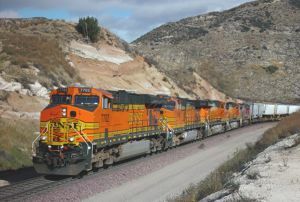 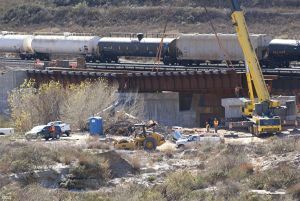 # 1: DET photographed HELPERS BNSF 5422/FM 4659 EB at bridge MP 64.1X. 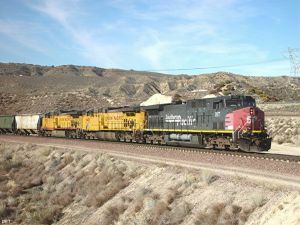 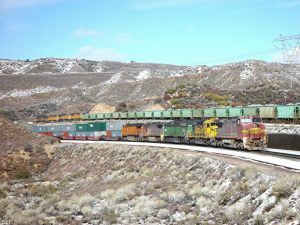 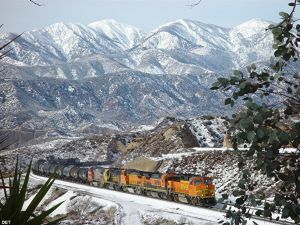 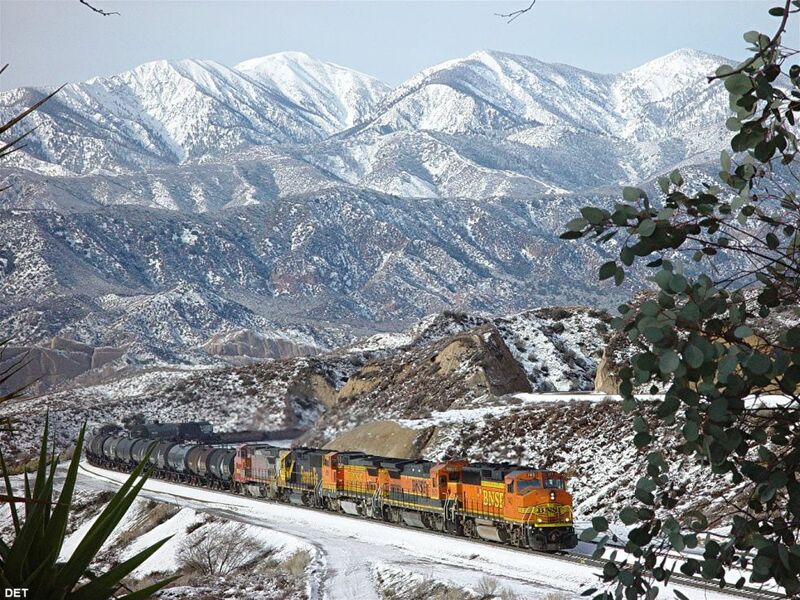 # 2: From West Summit Island, I (GGG) caught UP 4193 WB on the existing # 1 while UP 8585 climbs the UP/SP Palmdale Cutoff NB. 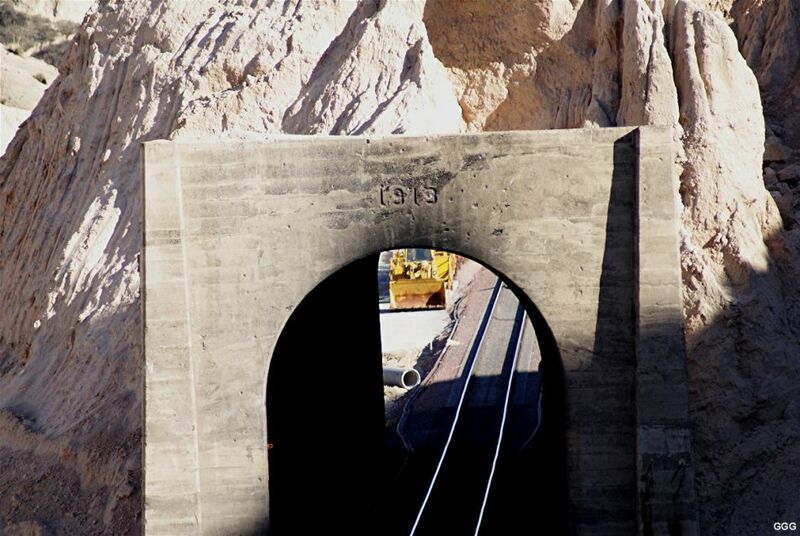 # 3: From West Summit Island, DET sends UNPATCHED (RARE, RARE) SP 187 EB to Summit. 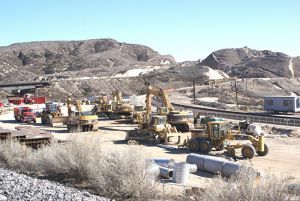 Just spent a couple of days with Don, et al as Ames Construction gears up for the final push. 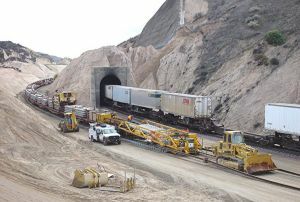 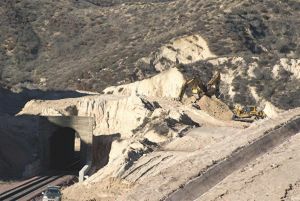 There's still a BUNCH of work to do but the dirt North of Tunnel One is now down to the new "track" level --- and both tunnels are just about ready for the sho-fly. 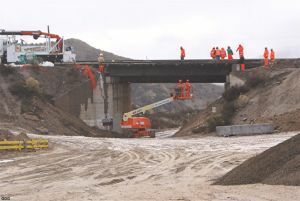 The five major bridge projects are nearing completion. I call them MAJOR bridges, although there are many HIGHER and longer bridges, since these carry millions of cargo tons daily, span a sometimes RAGING river, and cross the San Andreas fault. 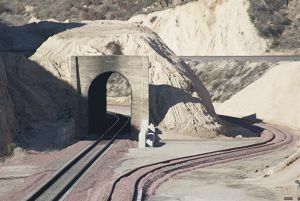 So, in the next few days, you're going to receive a BUNCH of pictures. 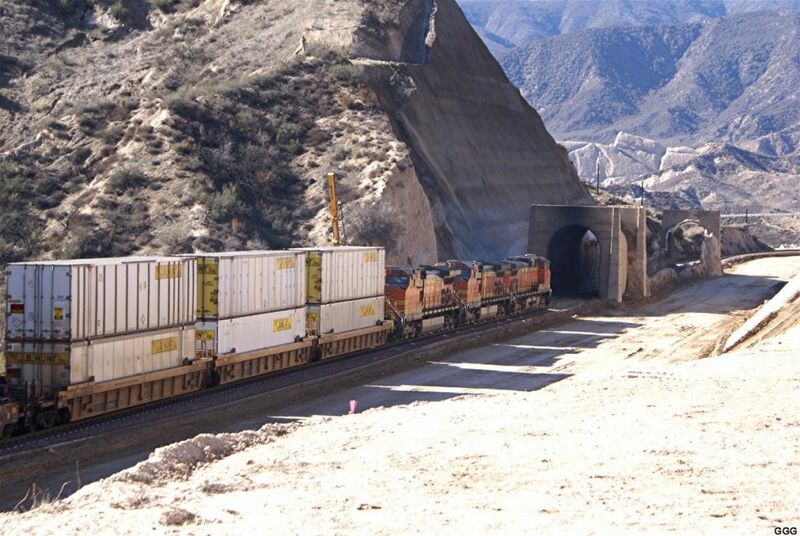 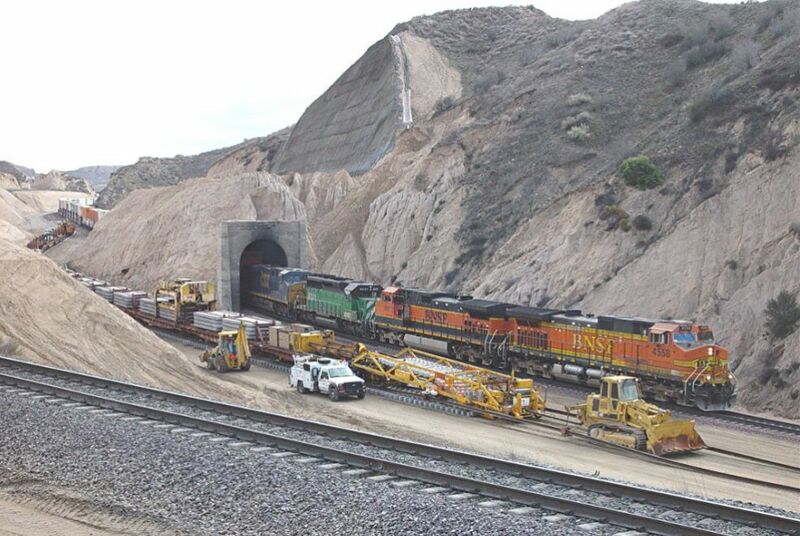 Starting with the tunnels and working RailRoad West --- The Tunnels --- The project is to remove thousands of cubic yards of dirt, down to track level, and bypass both tunnels with a sho-fly. 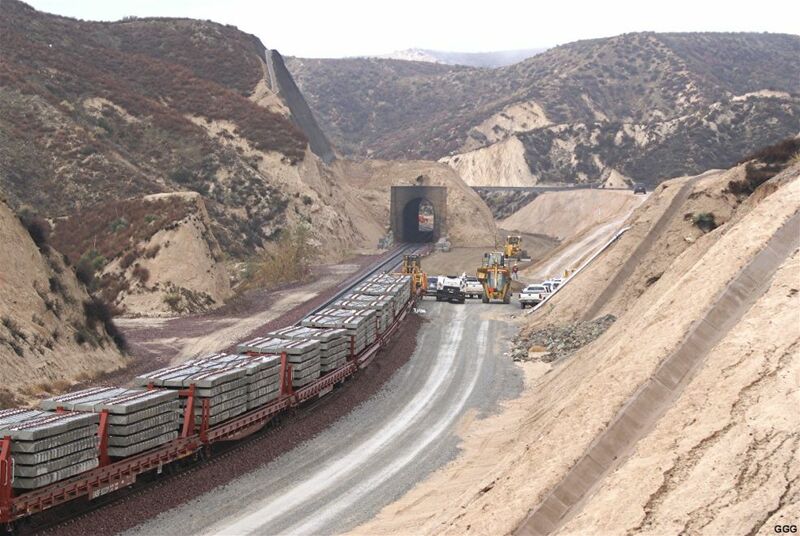 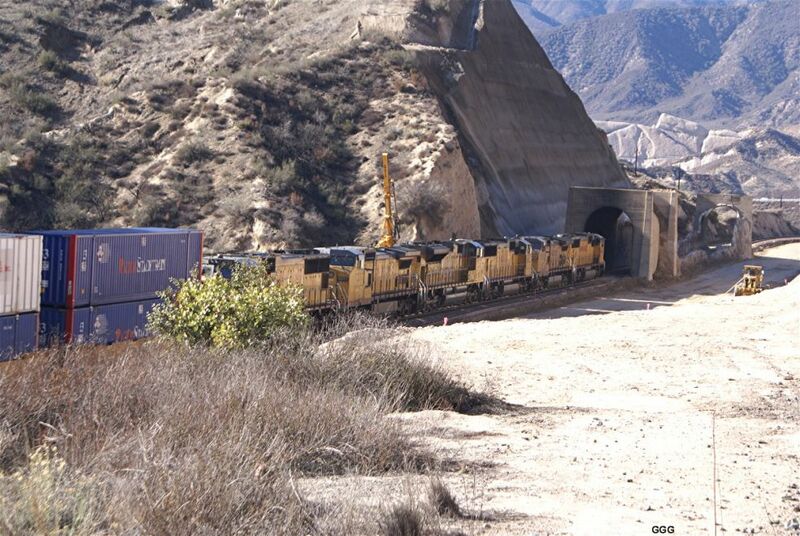 Next, both tunnels will be destroyed and the Shotcrete walls, to the south of both tunnels, will be completed. Lastly, next spring/summer, the new 3MT and the existing # 1 track will be built/rebuilt in the cut. 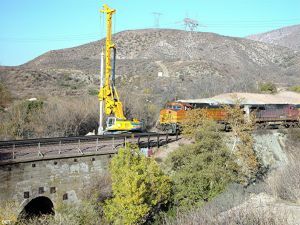 To complete the two remaining bridges (W Cajon Junction and Blue Cut), Ames is using some of the biggest equipment I've seen, to deliver and place the spans. 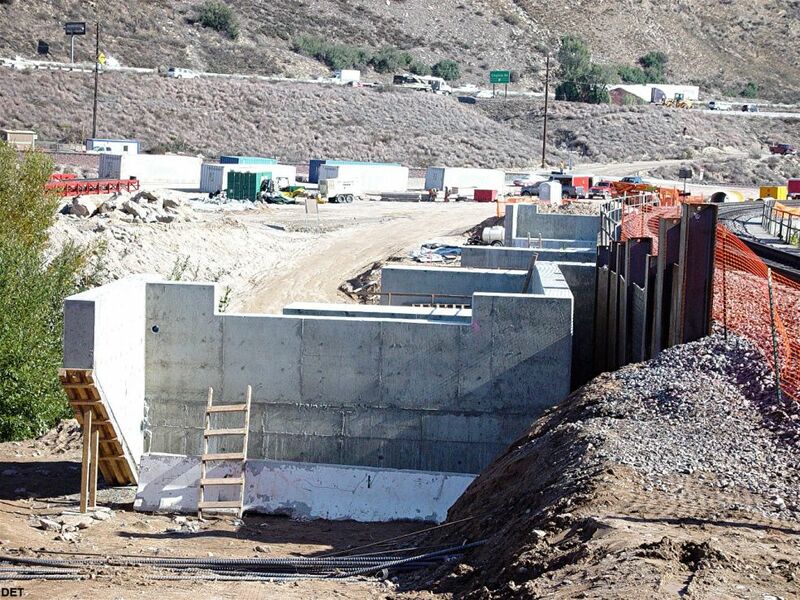 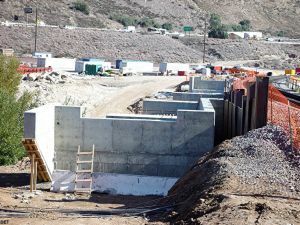 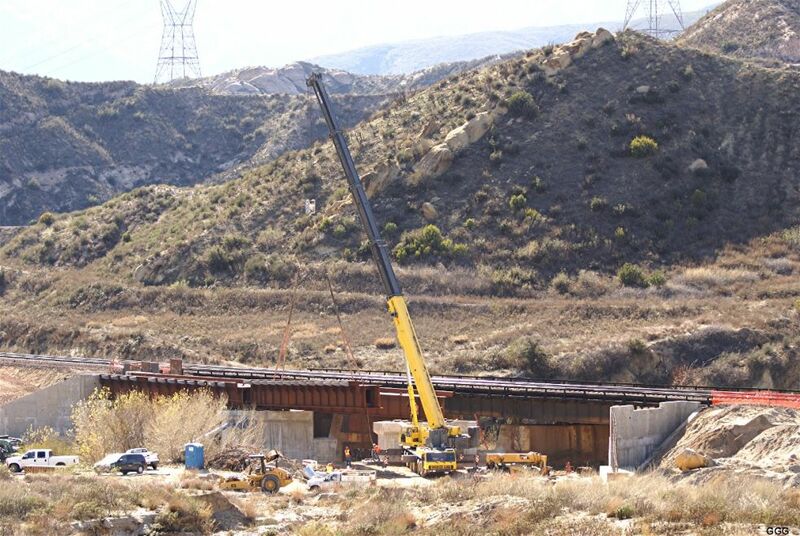 The W Cajon Jct bridge (MP 63.4) will have three spans using six steel box girders while the Blue Cut bridge (MP 65) will use four 90 ft concrete sections (two sides and two middle sections). 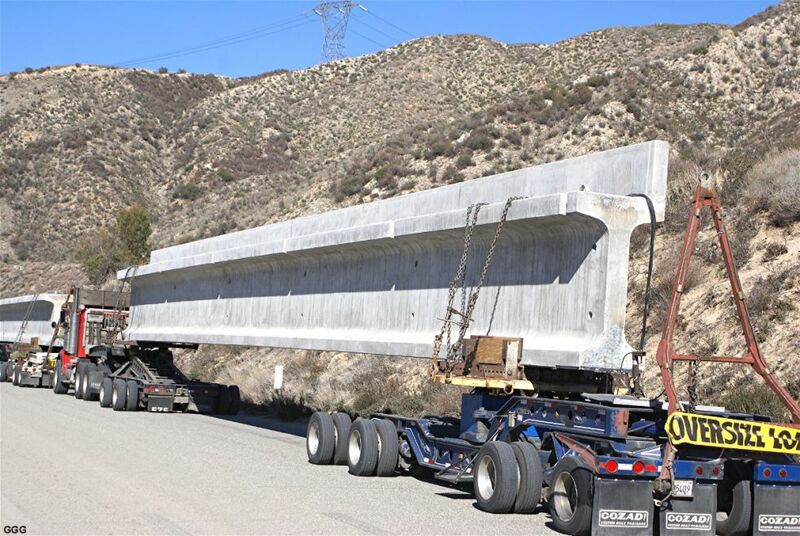 The steel sections are 25 tons each and the concrete sections are 78 tons each for the edge pieces and a bit less for the center section. 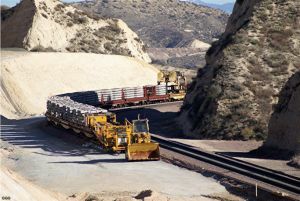 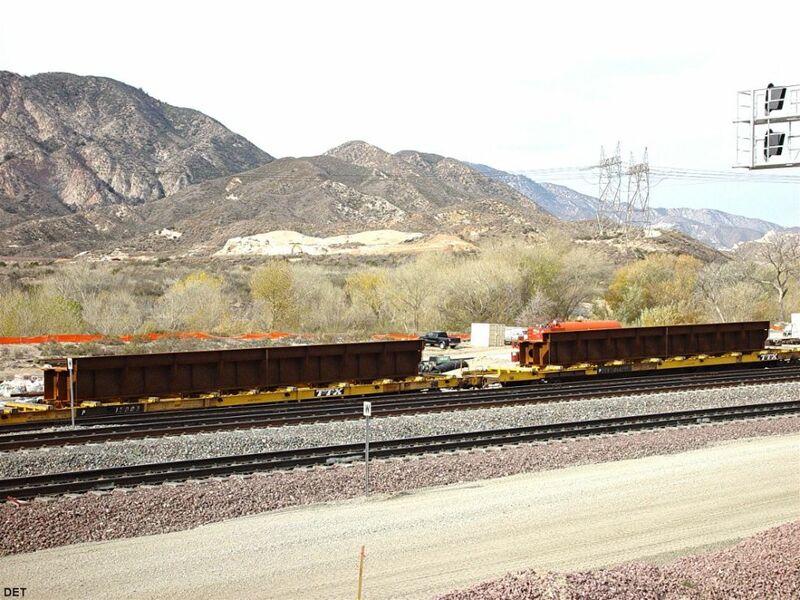 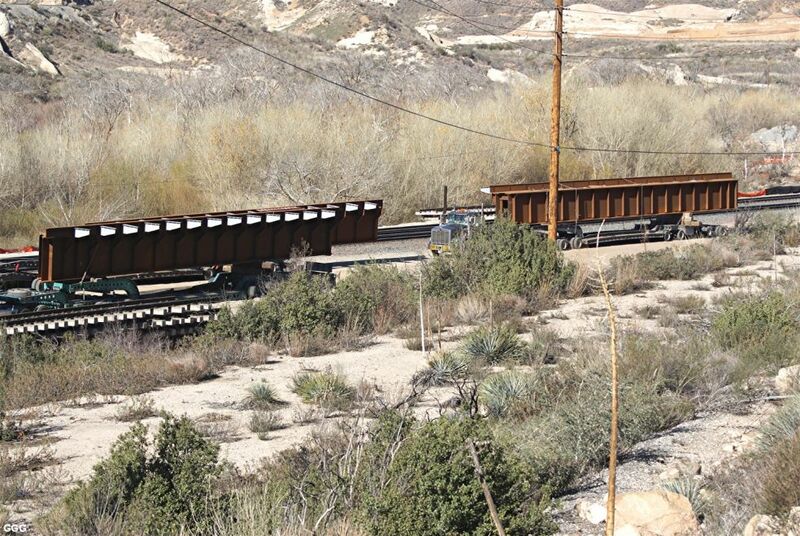 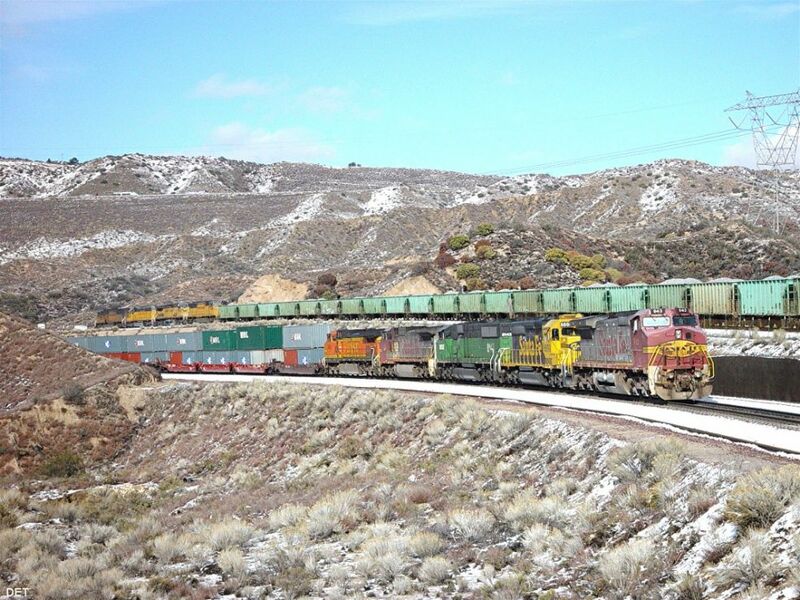 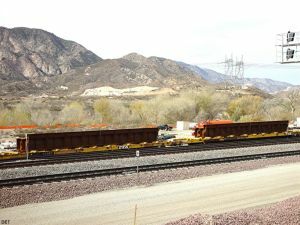 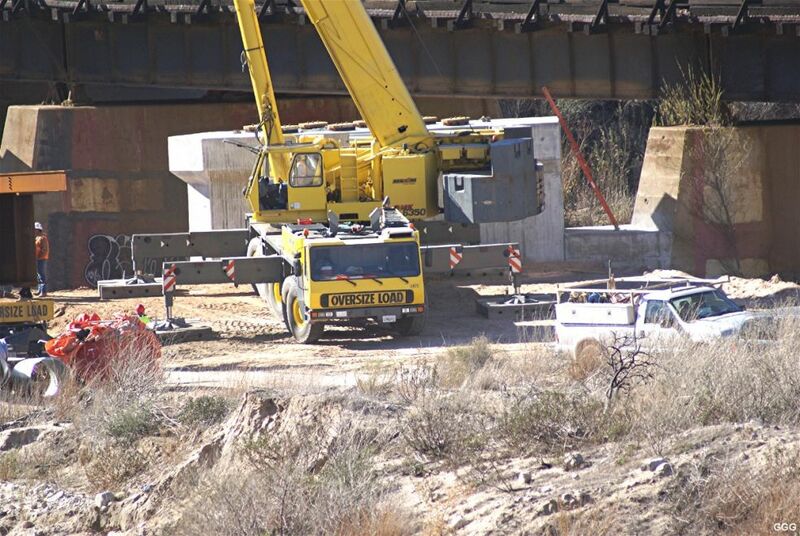 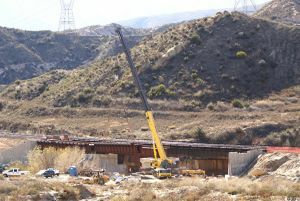 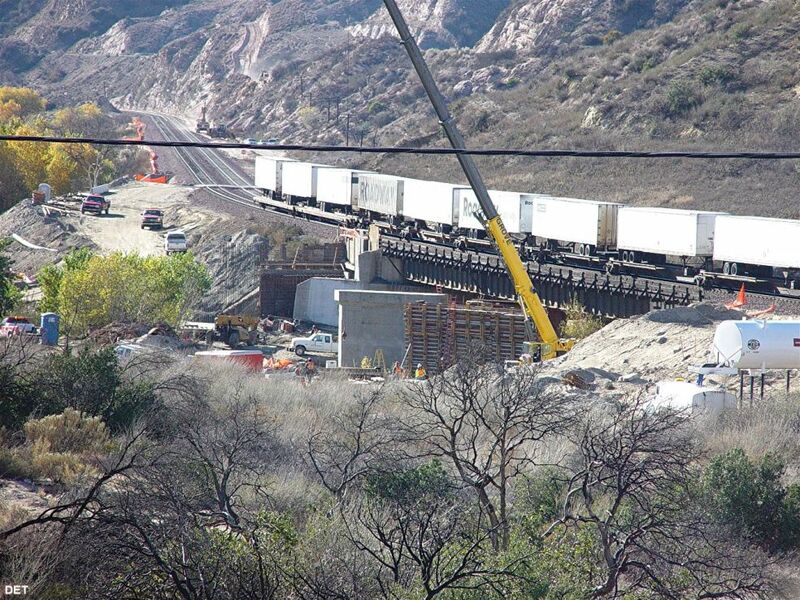 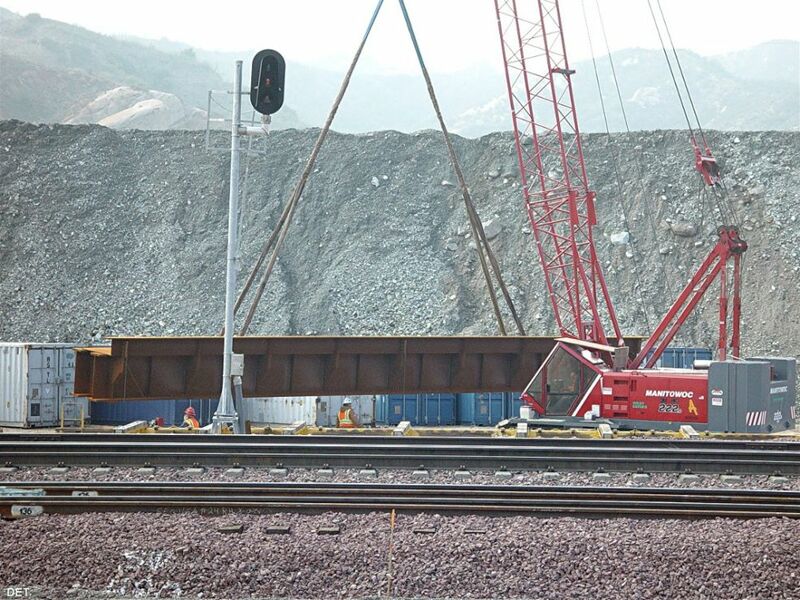 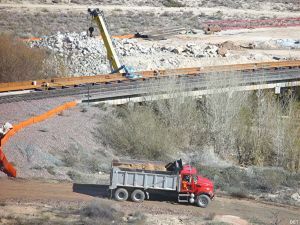 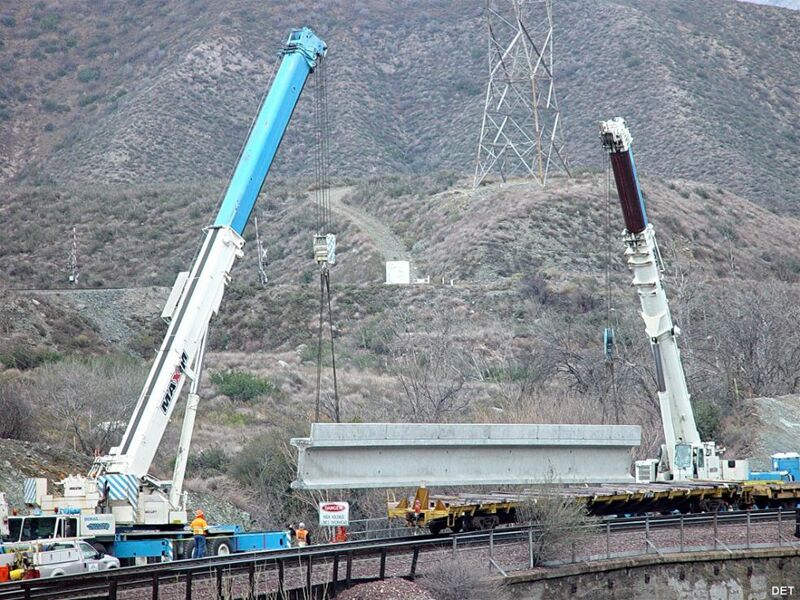 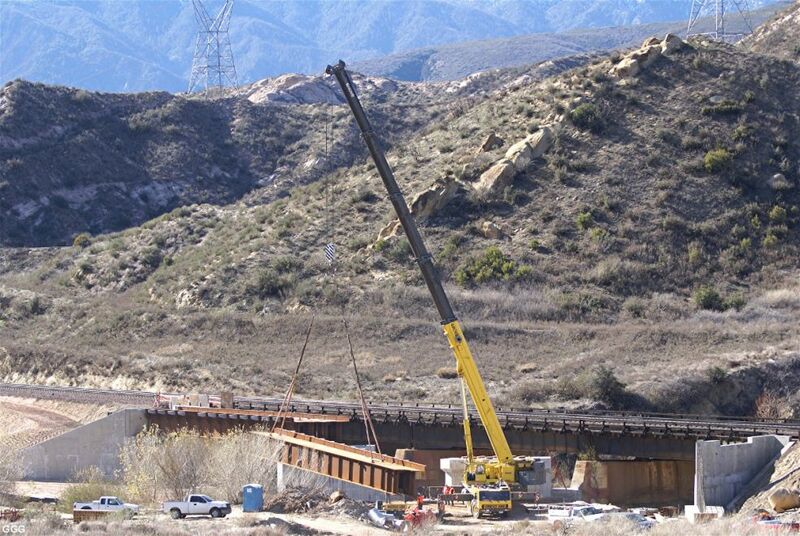 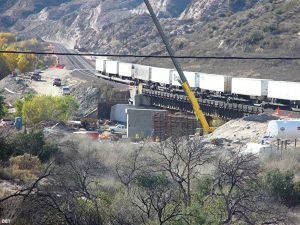 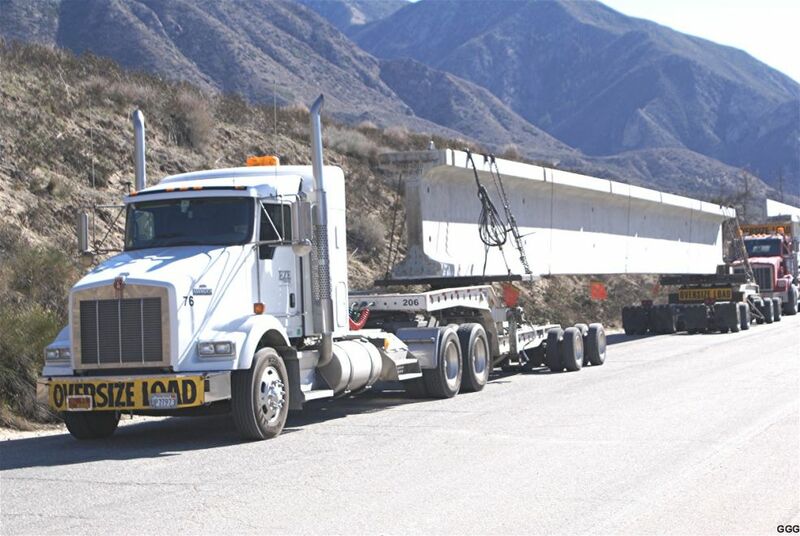 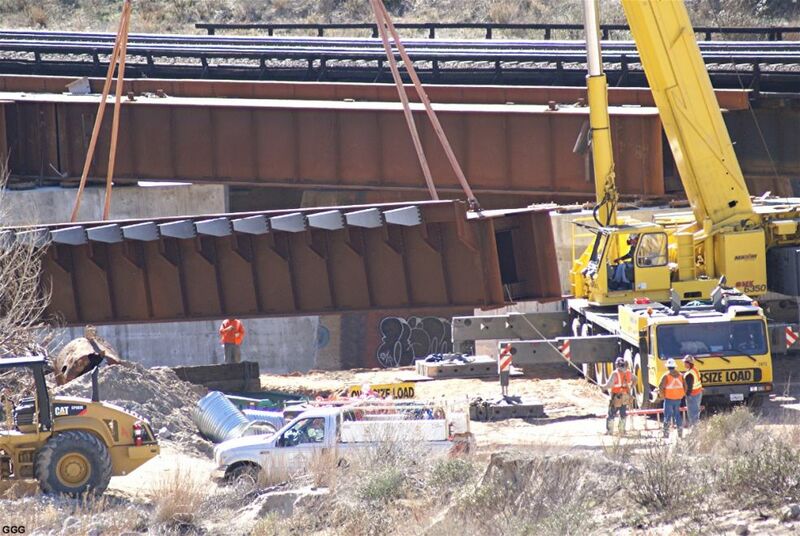 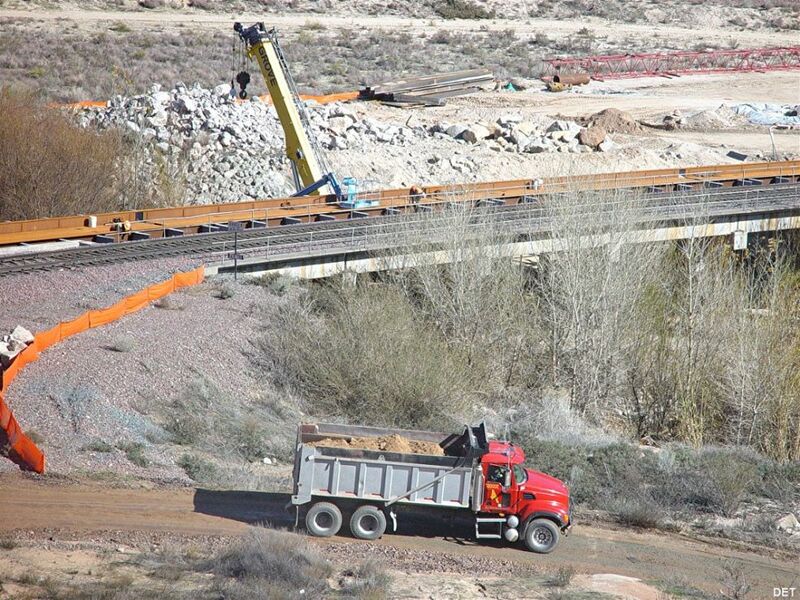 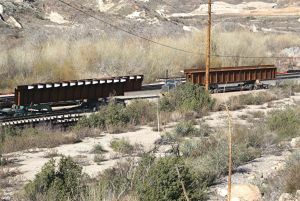 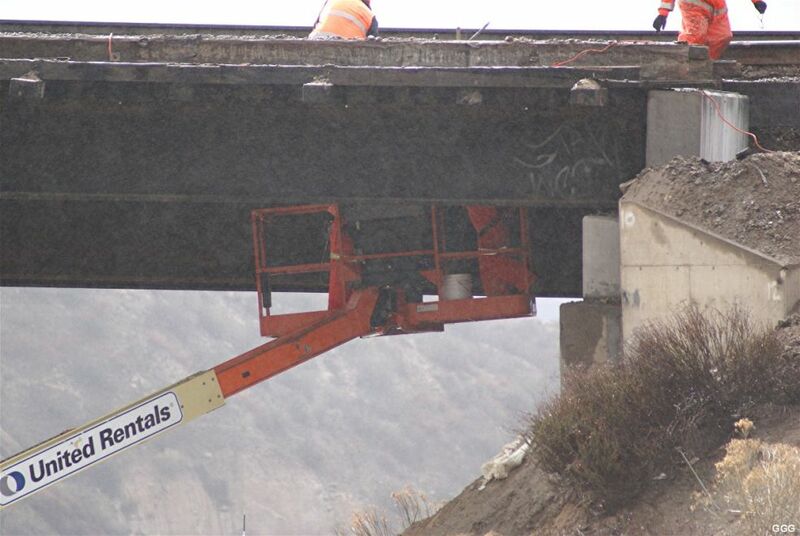 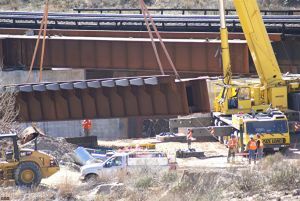 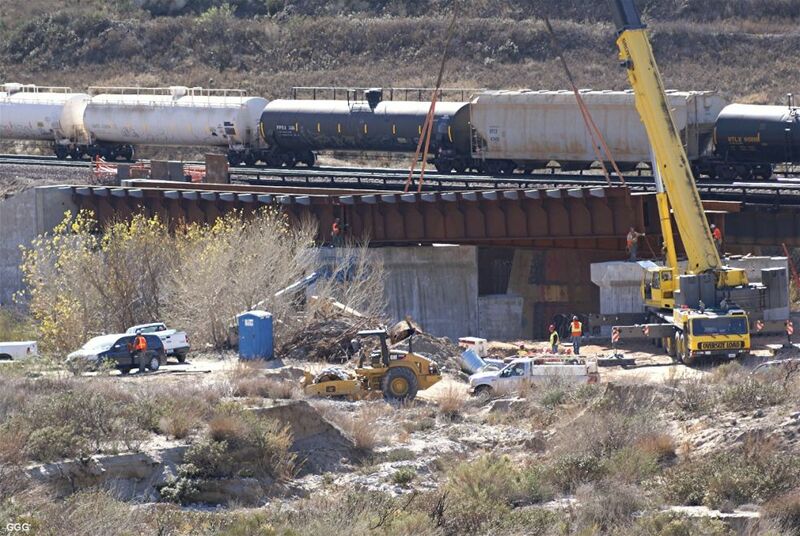 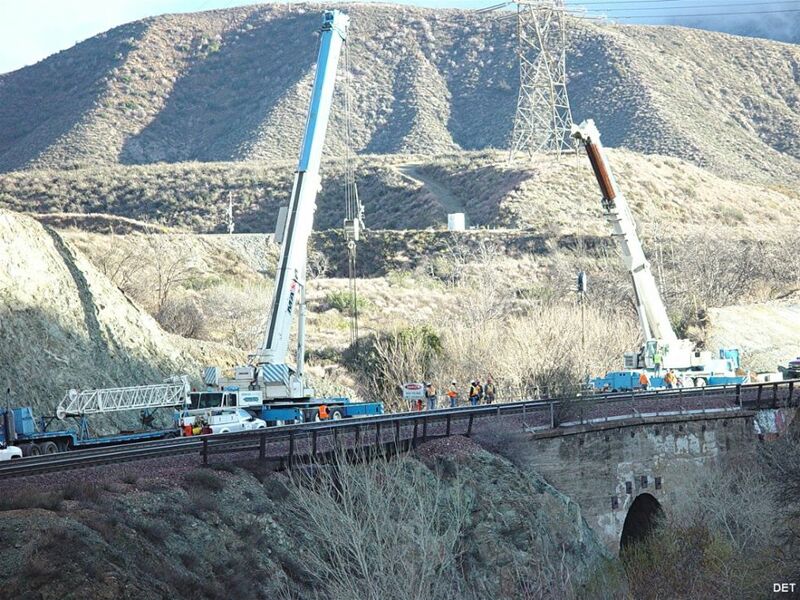 The steel box girders were delivered to Cajon Jct via RR Flat car, transloaded to trucks (pictures 347 and 348), moved to the bridge, to be placed by Road Crane (349). 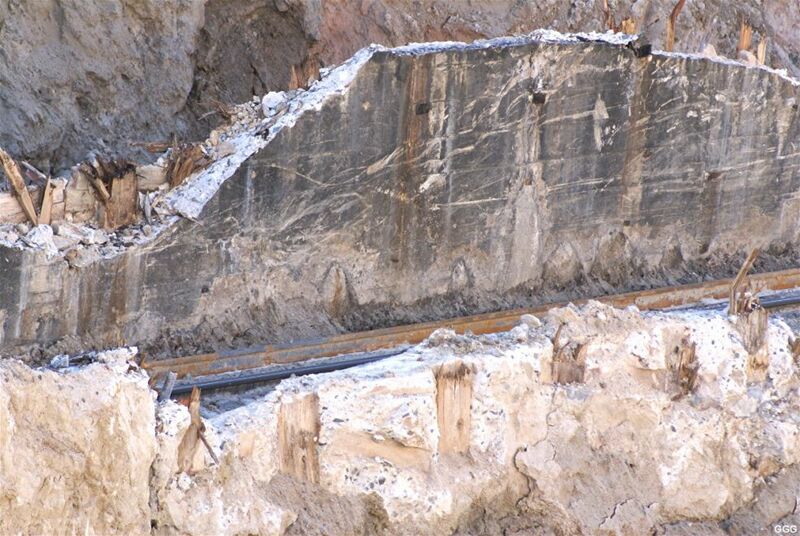 While looking closely at the remains of T-2, we noticed horizontal imprints in the concrete on both the inside and outside walls -- indicating framing. Also, large timbers are imbedded within the walls along with some rebar. So, the question is, thinking about 1913/1923 technology, how'd they do that ?? 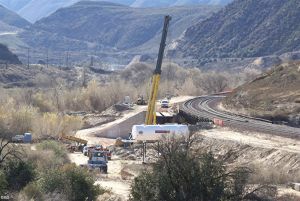 Photos 361 - 367: The bridge structure at Blue Cut is finished. This bridge crosses Lone Pine Canyon Creek and the Main San Andreas Fault at MP 65.1. 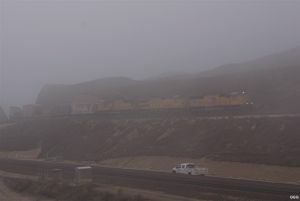 Photo 368: Leading edge of our present rain/snow storm from Hill 582. 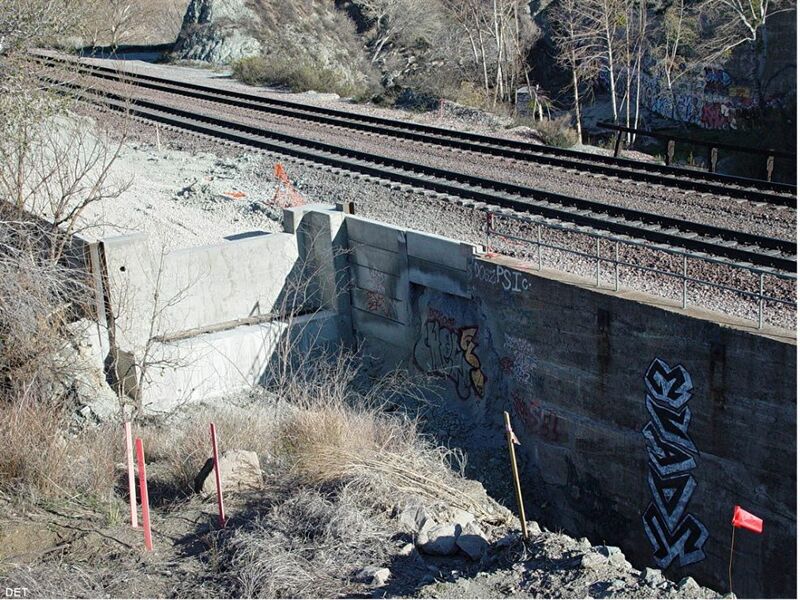 Also, you may see the foundations of the new signal bridge just RR West of "the hill". Photo 369: From Sullivan's, looking East --- A bit of snow on the mountains. Photo 371: Marc and Don just RR East of the Curved Bridge at MP 64.1X. 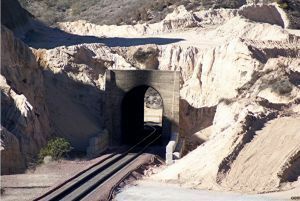 Photo 373: The old setout track and the bridge at MP 59.5X. 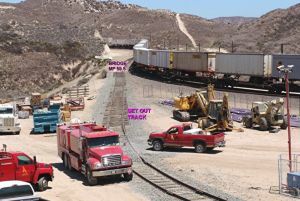 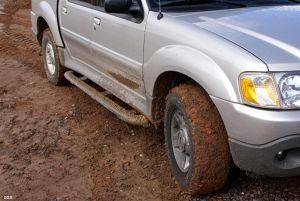 The track was covered to allow Ames trucks access to the equipment storage lot. 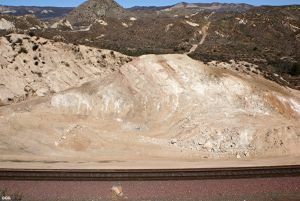 Photo 374: shows the area is question. Photo 375: shows the setout track and existing # 1 bridges. 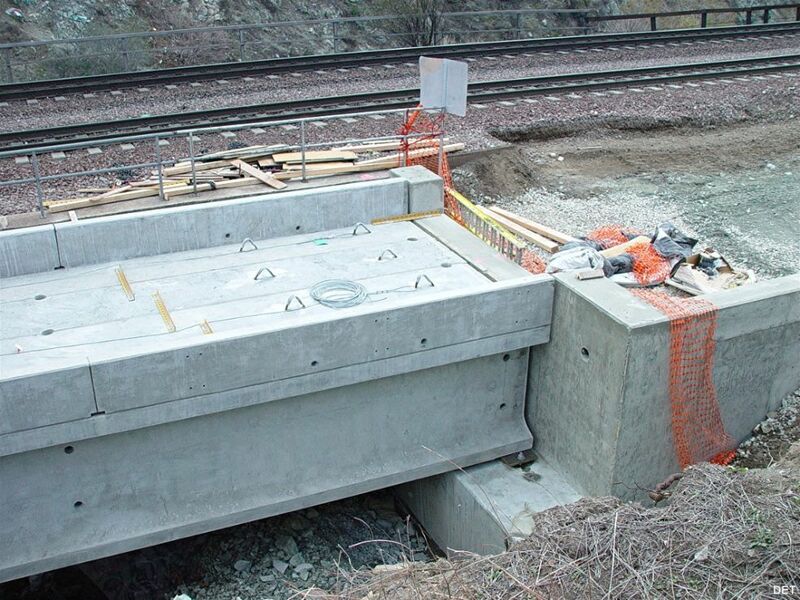 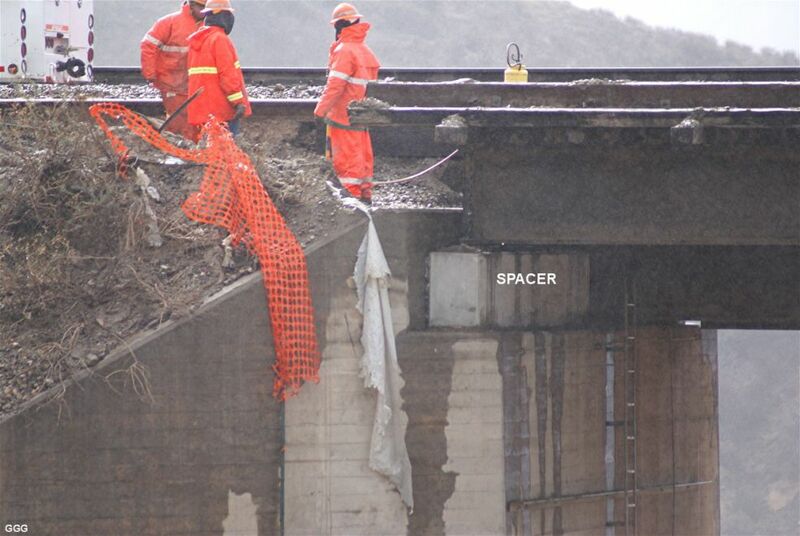 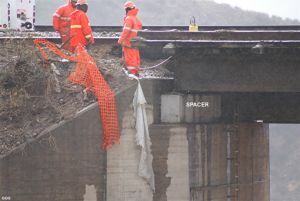 Photos 376 - 377: Close ups of the concrete spacers used to raise the bridge. 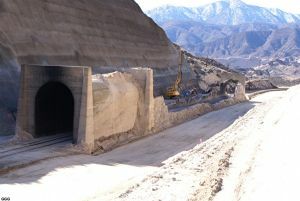 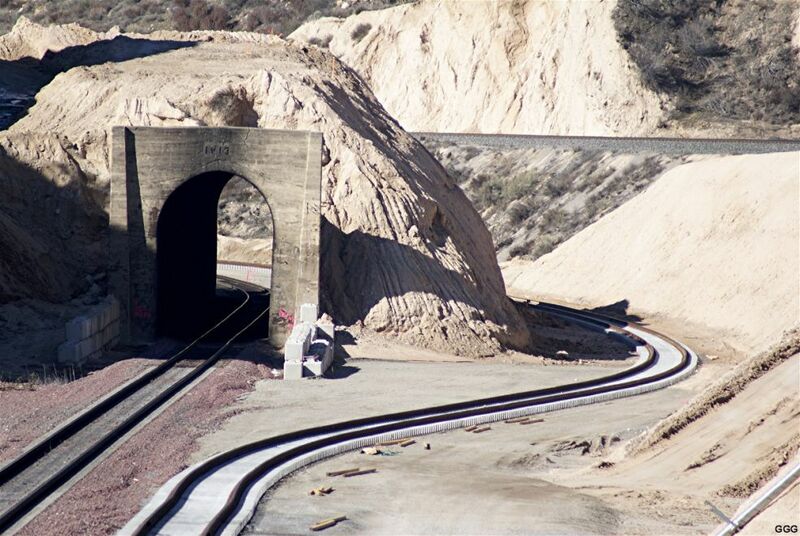 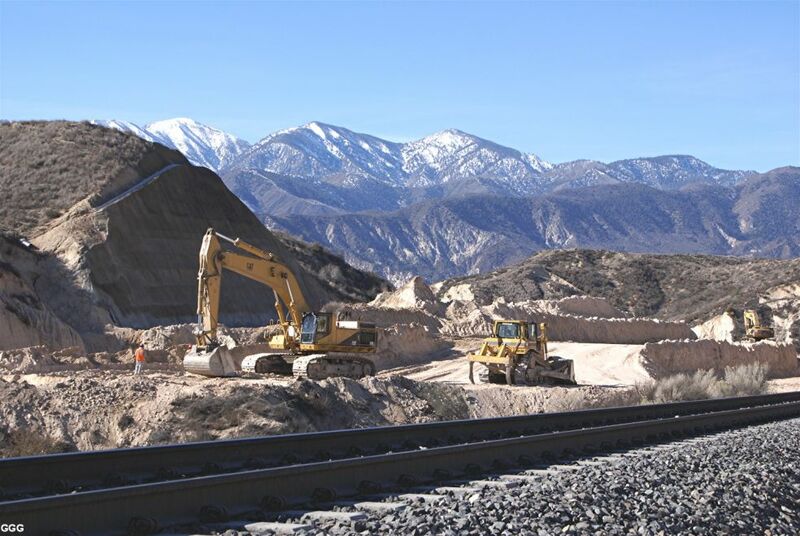 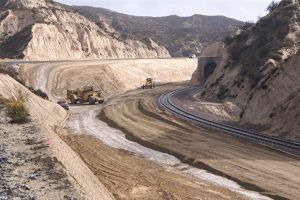 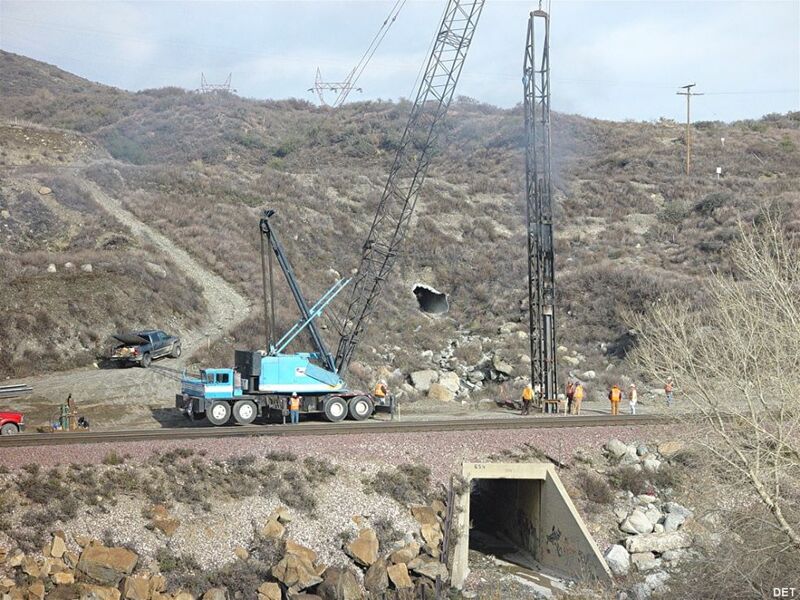 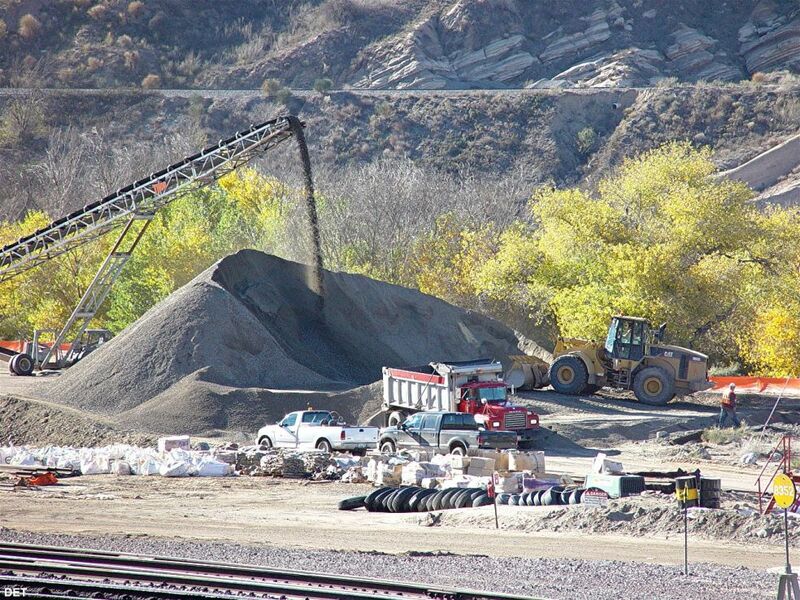 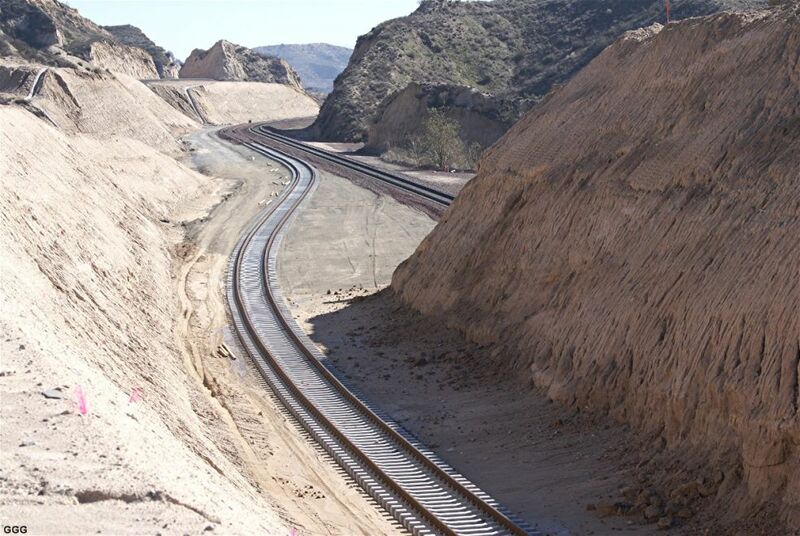 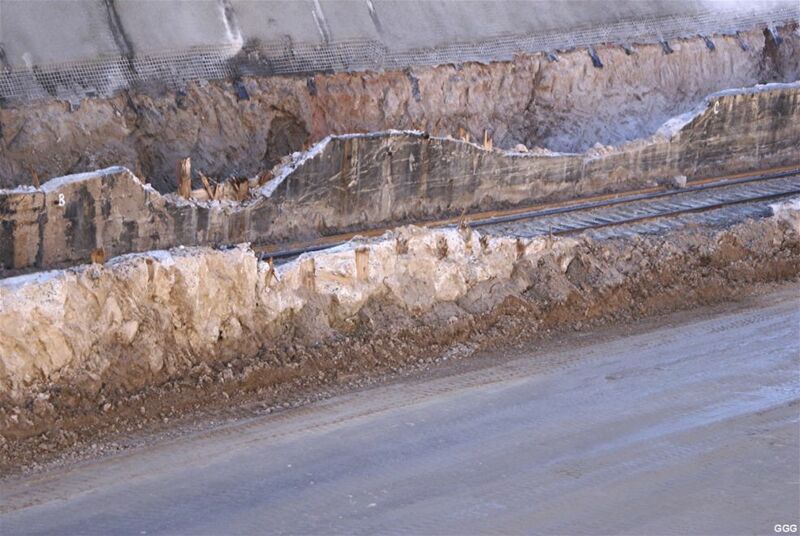 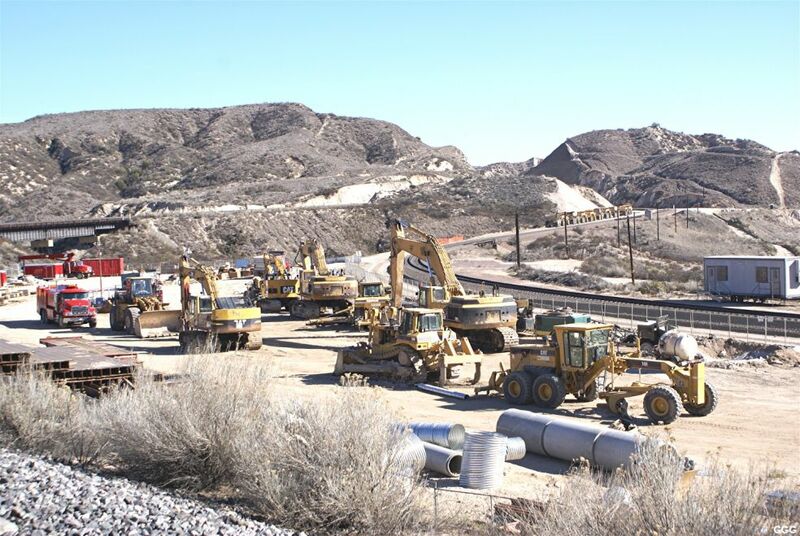 Photos 378 - 380 are of T-1 EP and the preparation of the sub roadbed. 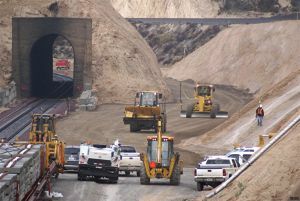 Note the GPS/laser leveling device on the road grader. 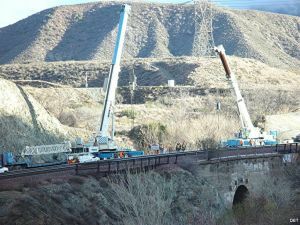 The TLM (Tie laying Machine) and Tie train are in place and ready. 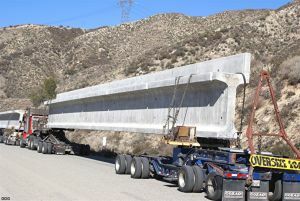 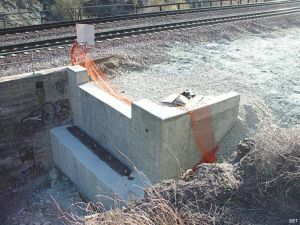 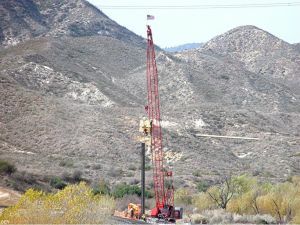 Photo 381 shows T-1 WP with the sub road bed. Photo 382 shows Ames removing the dirt between the South wall of T-2 and the ShotCrete wall. 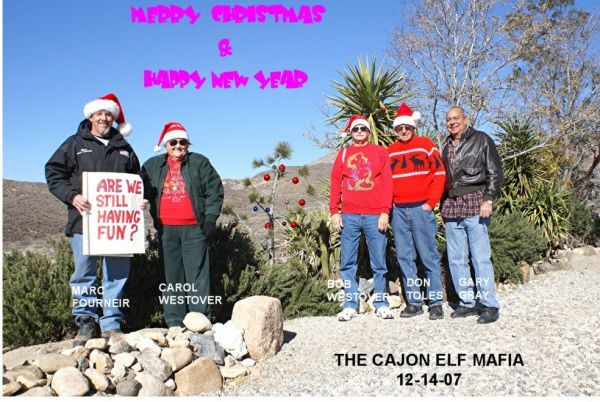 Two more places, where Don and Gary have taken many photographs, are GONE. 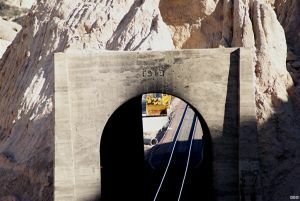 However, each loss brings on new opportunities. First, the hill just NORTH of East Sullivan's Curve. 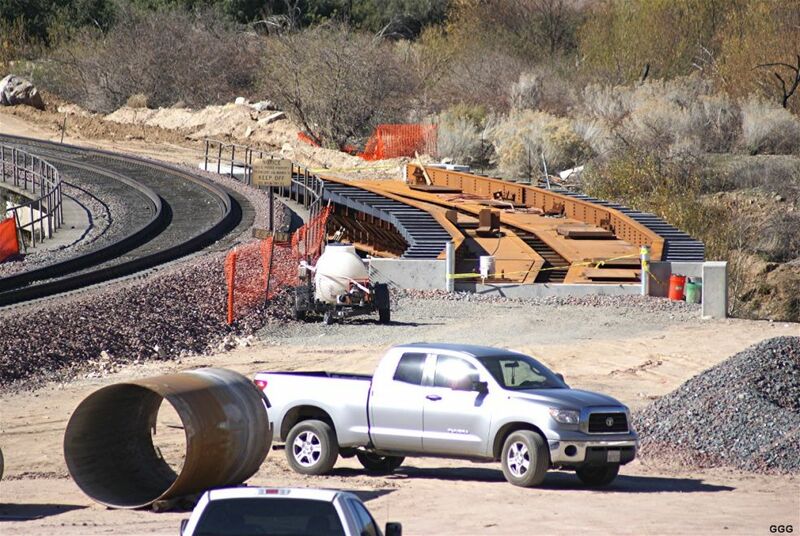 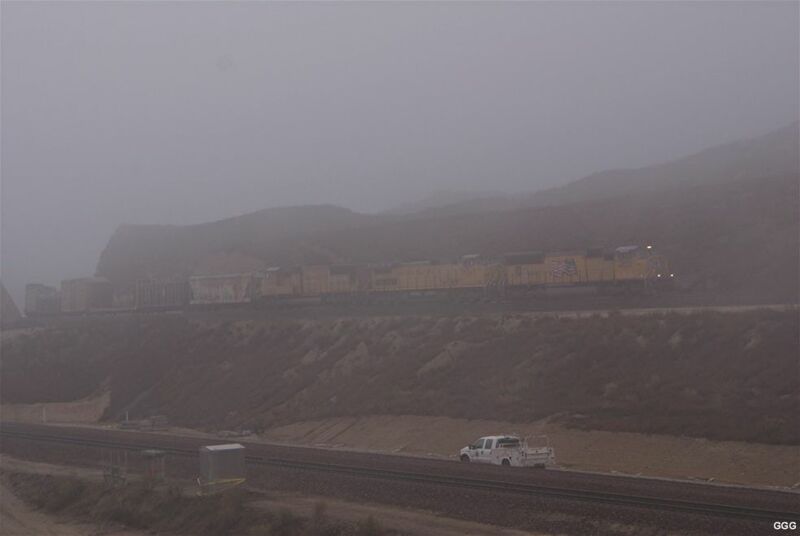 The loss of the hill across from the tracks now allows us to see WB trains entering the Curve. 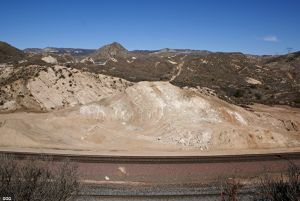 Photo 383 is from the Sullivan's overlook and shows the hill as it was. Photos 384 - 386 shows what's left of the hill. 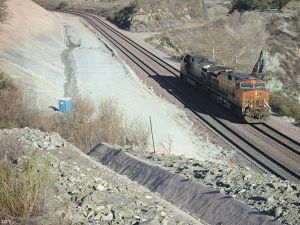 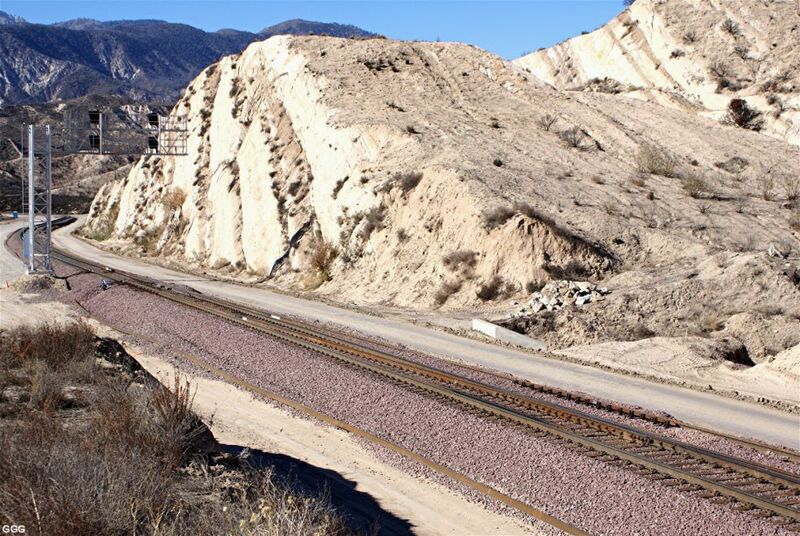 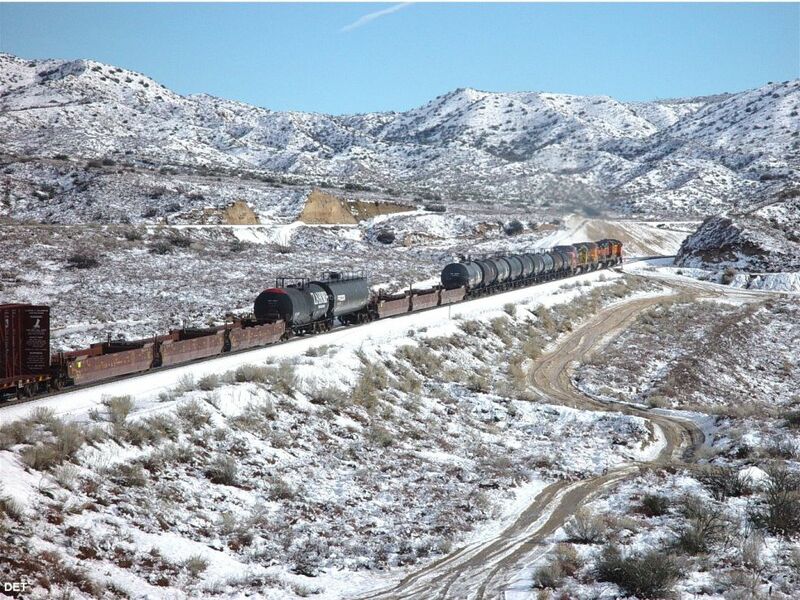 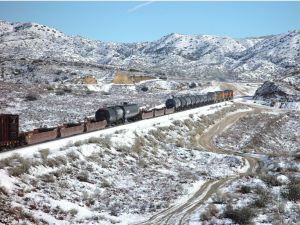 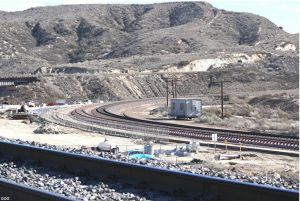 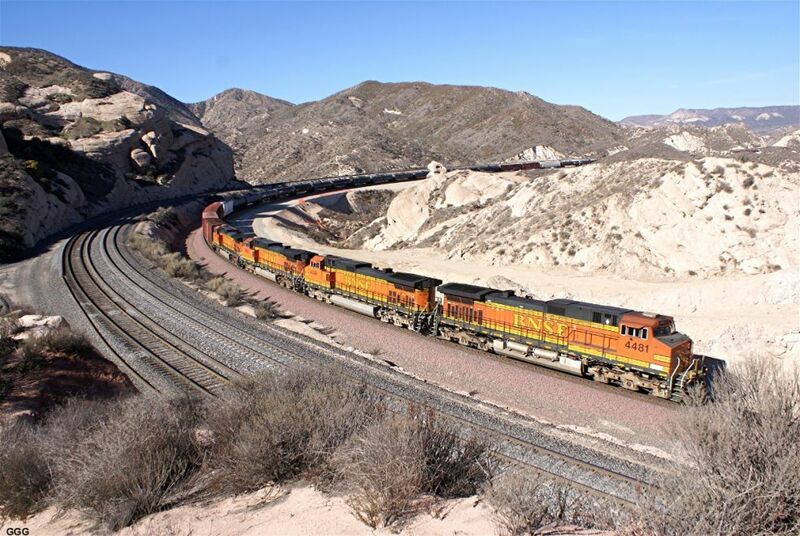 Second, a hill just BNSF RR West at MP 63.7X of the above hill. 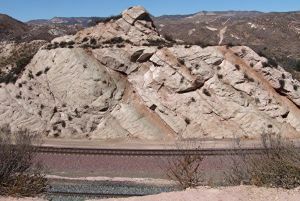 The rocks here had a special "pinkish" color. 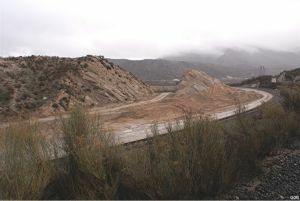 Photo 387 shows the hill as it was. 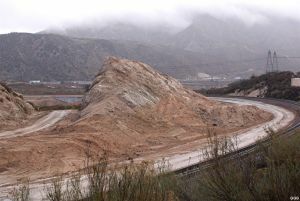 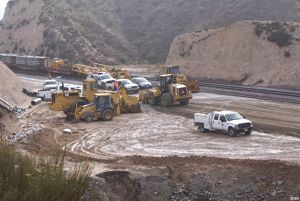 Photos 388 - 389 shows the hill as of last Monday with huge backhoes, drills and dozers working. 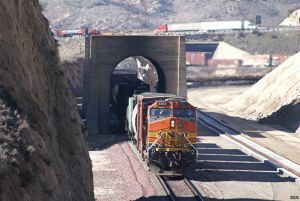 The Shoo-fly by-passing both tunnels is in-place, however, sitting on the sub roadbed. Ballasting should start next Monday. 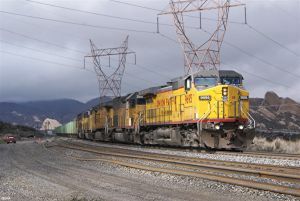 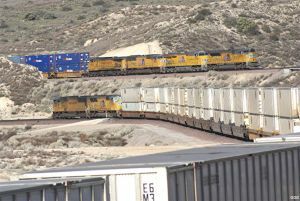 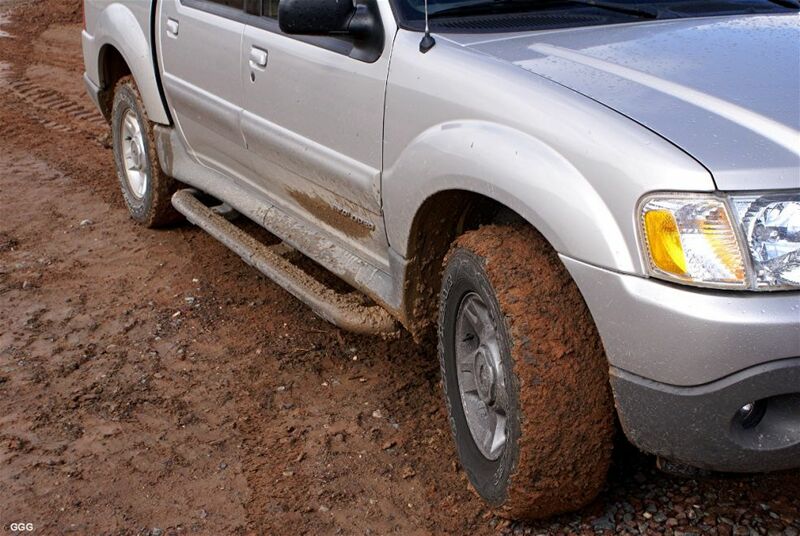 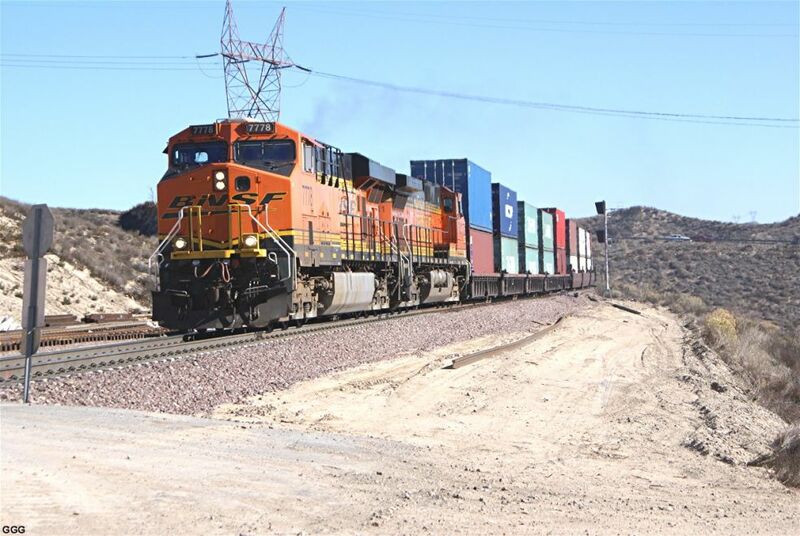 There are 50 cars of ballast sitting in Victorville. 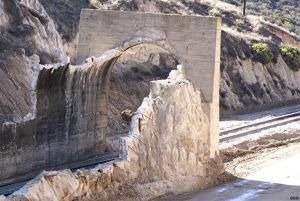 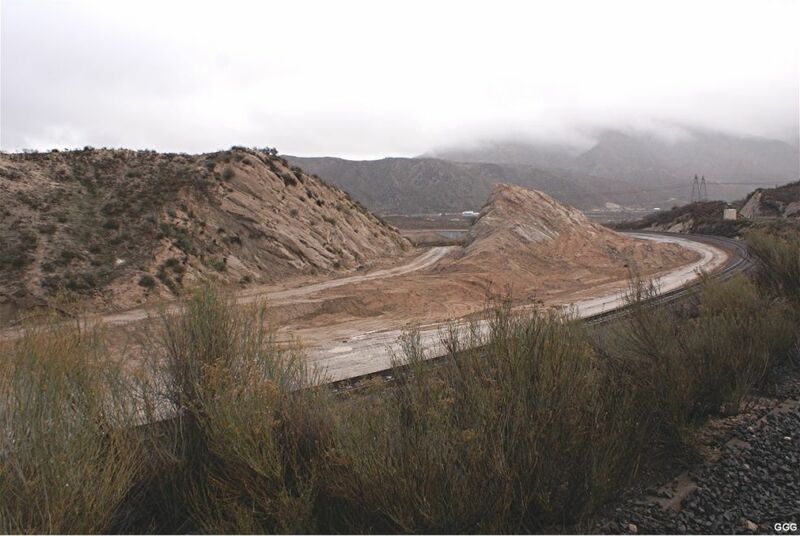 Our recent rains have caused several instances of erosion as seen in DET-photos 390 - 391 -- look just above and to the right of the T-1 West Portal. Interesting to see the TLM laying the Shoo-Fly. 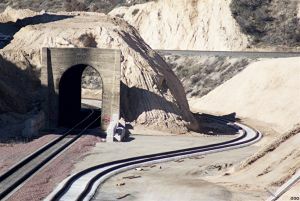 GGG-photos 392 - 393 of T-1 EP showing the sweeping curve needed to by-pass the tunnels.